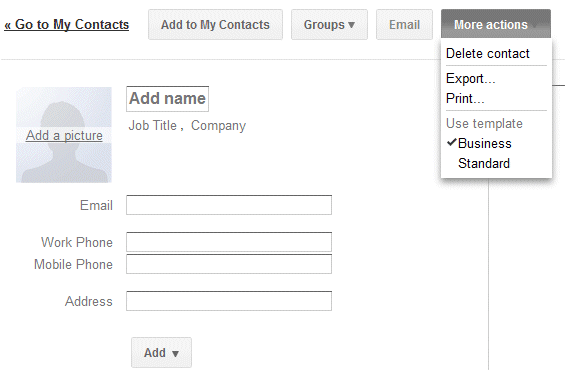 Gmail added a new feature that makes it easier to add a new contact: templates. If you click "More actions" when you create a contact or edit an existing one, you can select the business template to quickly add fields for the job title, company name, mobile phone and work phone. 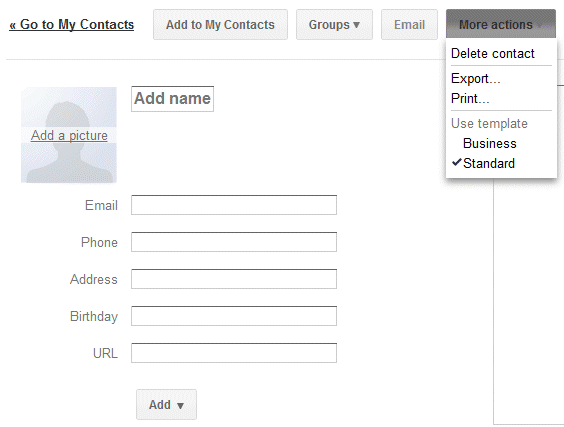 Google Contacts lets you add or delete fields, but you can't delete the fields from a template. Hopefully, Google will allow users to create custom templates and import some of the data from Google Profiles. I keep waiting for them, supposedly the creators of the most sophisticated parsing algos in the world, to do a reasonable job of parsing inbound mail signatures and pre-filling new contact entries. Instead, they don't even try. Custom templates will be a lot more usefull function. Sharing contacts!!! Or allow to email them as VCF to other contacts. Google, there's a lot of work here! I have been using an address book program called Open Contacts with such 'templates' function: Predefined Section which consists of some fields. The program came with a few predefined sections, while you may define your custom ones. I wish Open Contacts may sync with Google Contacts, as they are looking so alike now. As SyP, this is a all-or-nothing thing. One expects you would be abloe to choose for each contact if you want it as a professional or personal contact, but no, this is addressbook-widde and not contact-wide. So presently, utterly useless. But keep on trying, Google! Is there a way to set the Business template as the default template instead of Standard? i prefer that Google could incorporate some of yahoo mail feature.. the way yahoo team provide contact for their customer is very clean and the sleek design make it look professional .. Still not resolved - we would ditch our CRM DB if we could customise Google Contacts template!!!! Does anyone from Google read this? Is there a better past to Post this like APples forum, maybe google reads that? GOOGLE!! Just been looking up to see if I can add my own template in contacts and NOTHING.. and this thread is old. C'mon Google... surely it's not that hard to implement this? 2 years later... Same old, same old. Really shits me. I would gladly pay for an adding. Why no response? This is a modest change that would enable a huge shift to Google as a Contact Manager.